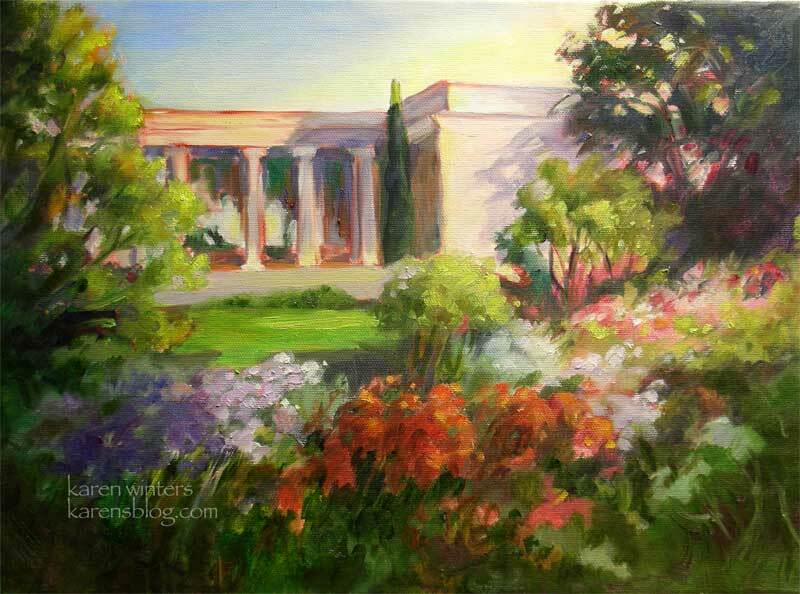 The moment I saw these beauties at the Huntington Gardens and Library, I just knew that I had to paint them. They were luminous in the morning light – exactly the kind of subject matter that excites me. This will be one of the paintings that I am bringing to the Art Matters show, which opens this Friday night, May 2 at the Huntington in San Marino. Friday night is a special ticketed event. 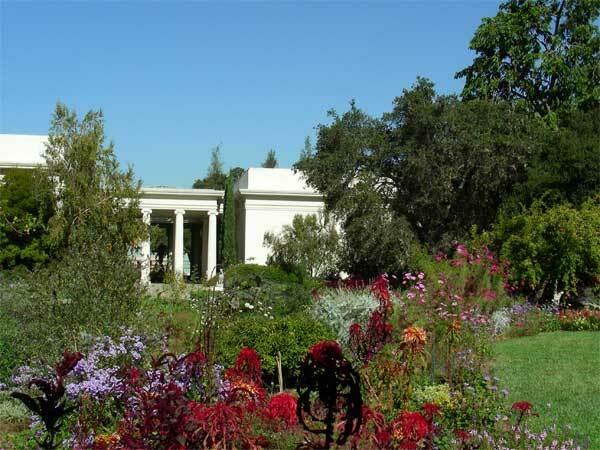 The show will be open to the general public with gardens admission on Saturday and Sunday. This is also a lot “tighter” than many of the paintings I’ve been doing of late, but the subject matter seemed to require it. 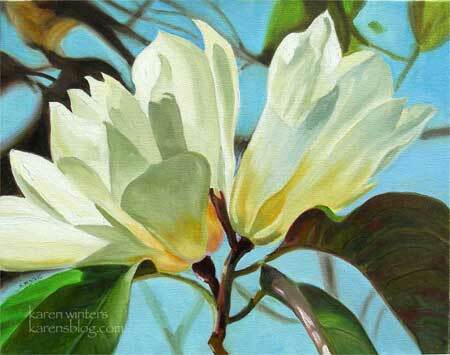 I have another botanical which will be there for the show and I’ll post it soon, along with some other paintings. Last Saturday night I had the wonderful opportunity to attend the Gold Medal show of the California Art Club at the Pasadena Museum of California Art. What an exquisite treat to be around such beautiful works. I will be returning many many times in the next few weeks to savor the show while it is still hanging. A number of my painter friends have works in the show. Almost everyone who attended said it was the best one ever. 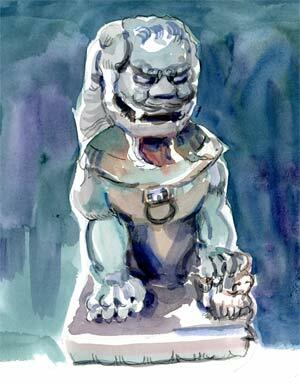 While I work on some large paintings, here’s a small watercolor sketch of a lion dog, also known as a foo dog. It is one of two guardians of the new Chinese garden, opening very soon at the Huntington Library and Gardens in San Marino. According to this article the one I drew is the female because she has a cub underneath her paw. The pair of foo dogs stand by the pathway that leads to the new feature of these beautiful gardens. In Southern California sometimes our seasons get all mixed up. Summer flowers are still blooming while deciduous trees have already lost their leaves. This tree stands outside a gallery at Huntington Gardens, and is in the process of losing its finery. Evergreens will keep the gardens looking lush and beautiful year round – from the tall conifers and deodars to cypresses and olives, like the little olive tree that stands guard on the other side of the doorway. I’m still not feeling well, but it hasn’t put a damper on my desire to make art. 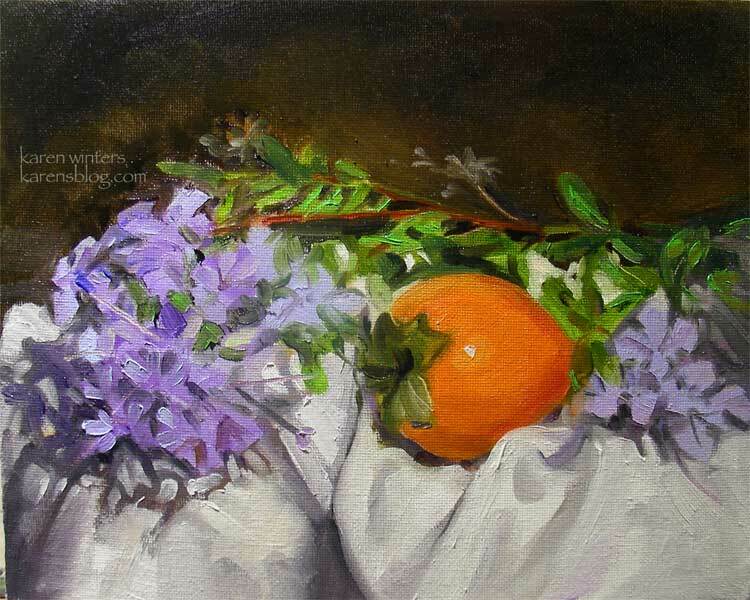 I just have to do it indoors rather than painting en plein air for now. This is the second in what will be an ongoing series of rose portraits – at least as long as they keep blooming, which will probably be a few more weeks from the looks of things at Huntington Gardens and Descanso Gardens. I think it’s the warm weather that is encouraging this last flush to be so abundant. This climber was twirling itself around a trellis without a care in the world. Here we are eagerly anticipating the return of our daughter from business school in Chicago. We’re clearing away the residue of months of back to back art shows and getting seriously organized until the next wave begins. Any day now I’ll have to give some attention to my garden which has been sorely neglected. Ironic, that. 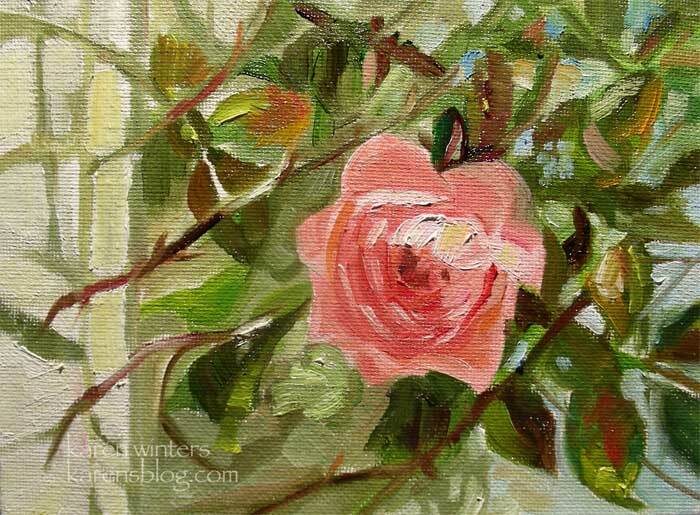 I spend more time painting flowers than pruning my own. If only there were a way to add an extra 10-12 hours a day I’d be just fine. 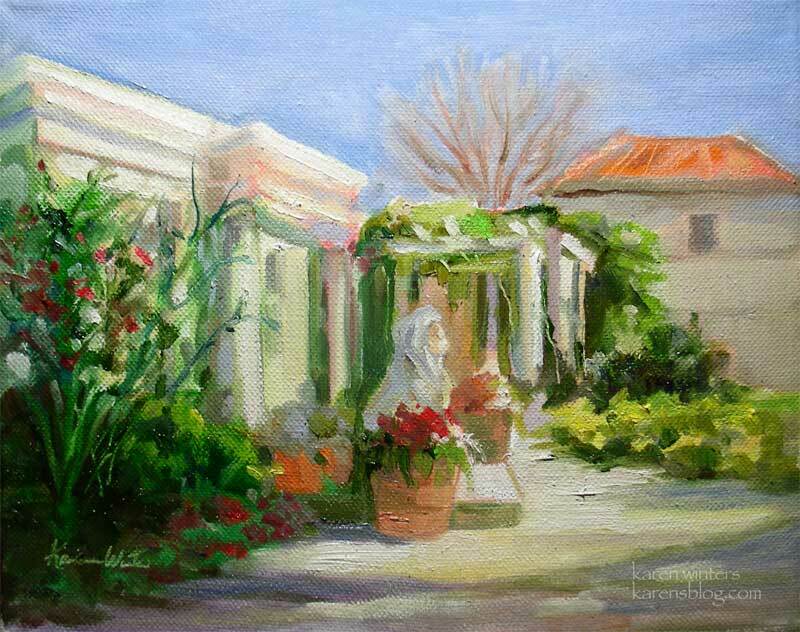 This studio painting depicting dawn in the Shakespeare Garden is based on plein sketches and photos I’ve taken at the Huntington. In fact, I’ve never been there at dawn, but I’ve taken some liberties with a noon photo (below) to imagine how it must look at the peak of fall bloom. Changing the time of day and angle of the sun was a real exercise in thinking about color, shadows and so on because I had no reference to rely on. I remembered that white marble often glows pink in the morning, but there are touches of warm, too. To break up the wide expanse of the wall I invented shadows, but then I had to think about what color they would be. The same is true of the shadows of the side of the building – where would they cast shadows? The sky is different at dawn. Darker at the top than at the horizon (as usual) but it is warmer in the direction of the sun. 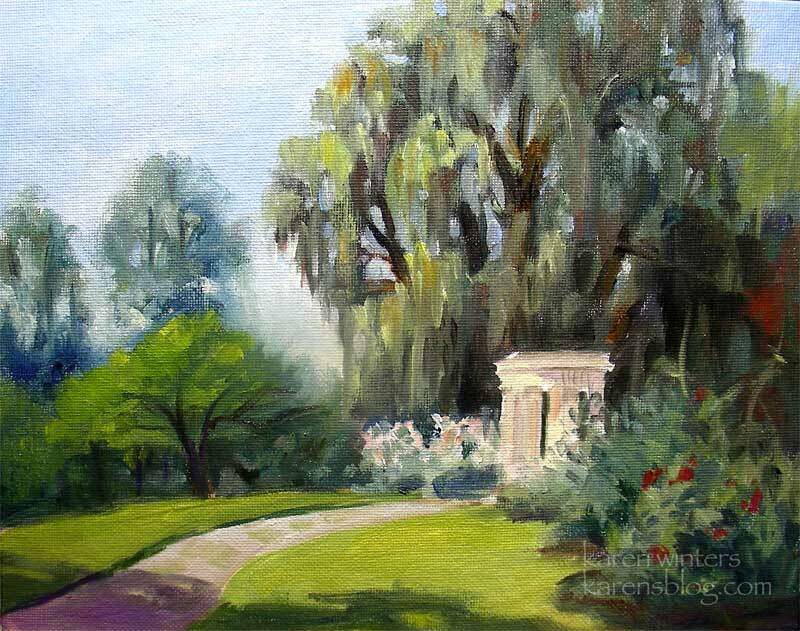 So those colors needed to be softly blended to suggest the right atmosphere for that time of day. I find this kind of exercise a lot of fun because it helps me to break out of painting that is just copying. This can be useful for plein air painting, too. 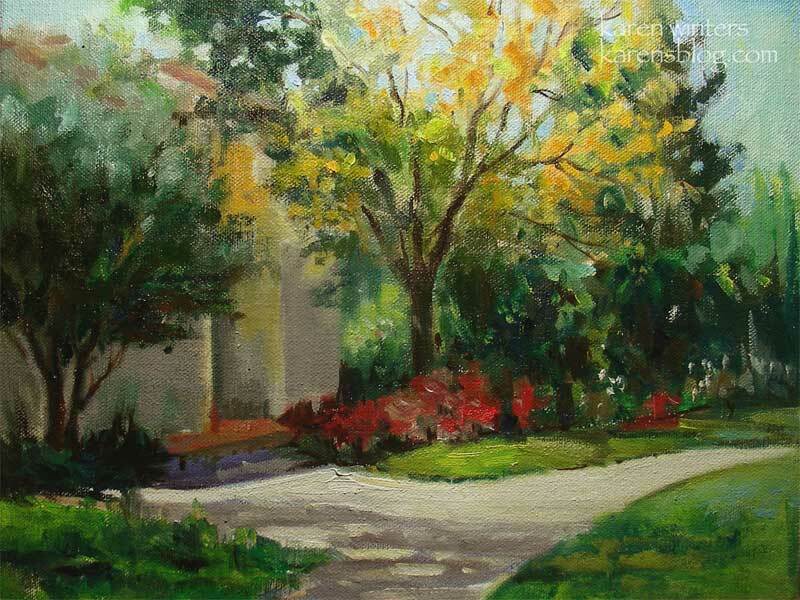 For example, if you are a distance from your subject and you know there’s a shadow there but you can’t see it, you can use imagination and logic to decide what color to paint it. The truth in advertising part of this program compels me to confess that this was all painted from life at a paintout except for the sky – because I inadvertantly left the house without my tubes of paint – and there was insufficient cerulean and cobalt on my palette to do the deed without running out. So I used what skimpy blue I had to fill the area with the right color thinned with mineral spirits, but the thicker paint had to be applied after I got back home. There. I feel so much better. Frankly, I might repaint that tree that has already shed its leaves, but I sort of liked the fact that it represented fall at the gardens. So I’ll have to think on that for awhile. The story of this painting is mainly about light – how it falls on the facade of the teahouse and the lion(s) that guard its entrance. The other lion is obscured by the front one so I left it out. OK, and here’s some art news. 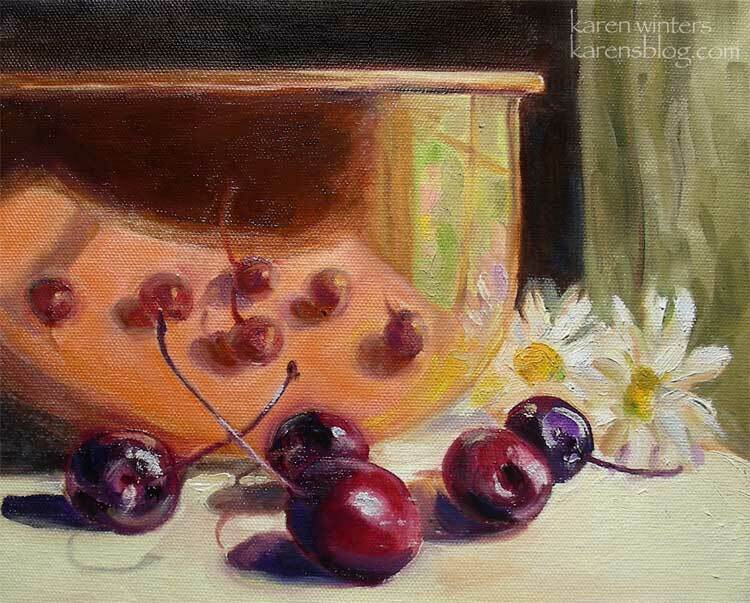 On Sunday I took the below painting to the San Gabriel Fine Arts Association meeting – which I’ve missed attending due to being at Descanso and other commitments, and I was thrilled to get first prize among the paintings displayed for competition, and to be chosen as artist of the month. The painting will go into the SGFAA gallery on Wednesday for a month and will compete in December for artist of the year. 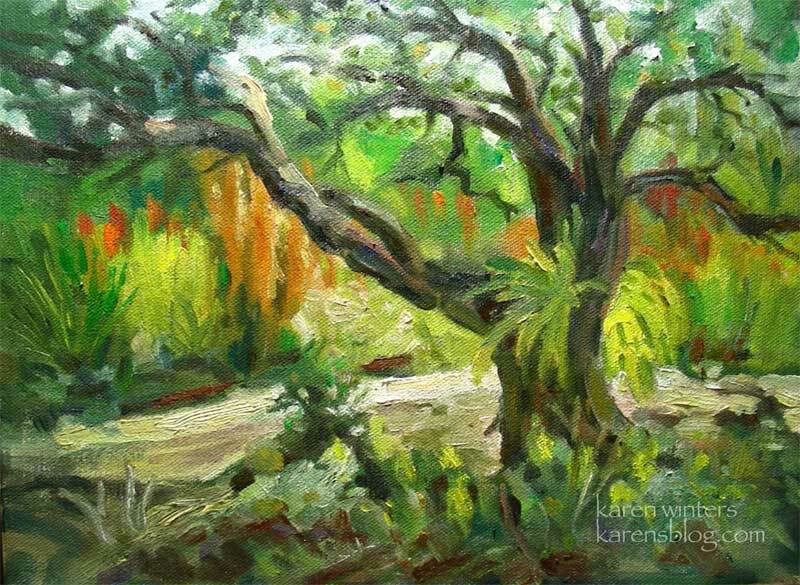 And this painting got an award at the Verdugo Hills Art Association fall show. All in all, a good month!